Child labour, displacement of indigenous communities from their traditional lands by mining operations, groundwater depletion by beverage companies, and habitat destruction by transnational corporations and wealthy landowners are just a few examples. Whilst regulations to protect business investment are well developed, there is a lack of similar enforceable regulation to protect the environment and the people affected by the activities of corporations. Some businesses have now grown to the point where they are more powerful than many governments, which underlines the need for an effective international mechanism to ensure greater accountability of businesses and access to remedy for victims of their operations. The need for such an international legal framework was recognised by the UN in the 1990s but the proposal put forward was strongly opposed by the US, resulting in a compromise document containing an international set of non-binding recommendations entitled “UN Guiding Principles on Business and Human Rights” being approved by all UN member states. 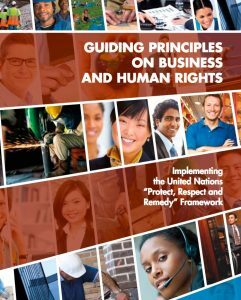 Whilst the guiding principles were seen as a step forward, the duty to protect human rights was assigned to states, with businesses being encouraged to respect human rights but not bound by any obligation to do so. As large variations exist in different national legal systems and gaps exist in the international system of human rights protection, corporations can circumvent existing laws and continue to operate with impunity. Recognising this, many governments, academics and NGOs since 2013 have been calling for global comprehensive treaty to ensure the protection of human rights from the activities of transnational corporations and business enterprises. Despite the opposition of the US, European Union and Australia, in 2014 the UN Human Rights Council voted to establish a Working Group to begin the process of drafting a legally binding instrument. The Working Group has since met three times and considered input from a range of actors. An initial draft of a proposed treaty will be presented and negotiated at the Group’s fourth session in Geneva in October 2018. Despite the progress made, a number of states and powerful business interests remain vehemently opposed to the idea of a treaty and many obstacles remain before it can become a reality. This article was adapted from research undertaken by Cecile Stone from Franciscans International (FI). FI has a particular interest in this issue.